All about Cynthia’s writing- books, ebooks, and articles on her website. My New Book Is Available!! After a conversation with a dear friend in early July, she inspired me to write a new book. It is designed for a slightly different audience than usual. Normally I write for those of us who know at least some about Narcissistic Personality Disorder. This book, however, is written for those who know something is wrong with a person in their life who is extremely selfish & manipulative, but they just aren’t sure what it is yet. “It’s Not You, It’s Them: When People Are More Than Selfish” helps these people to understand Narcissistic Personality Disorder, deal with the behaviors if they opt to stay in a relationship with the narcissist, & ways they can help themselves heal. I’ve learned so much about NPD in recent months & have felt such a strong desire to help victims of narcissistic abuse & raise awareness, I believe this book had to be written. Admittedly, I’ve never written a book so quickly before, but I believe it must be for a reason. I pray God is going to use it mightily. 20% Off Two Or More Print Books! My publisher is having another great sale on print books. 20% off if you buy two or more. Simply use code 2FORYOU at checkout. Sale ends August 7, 2016. Over the years, some of my readers have told me that they believe I’m a warrior for those who have endured narcissistic abuse. That has always stuck in the back of my mind because I knew it was important. Just recently, their words came to the forefront of my mind & wouldn’t leave. I knew it was important but didn’t know why. Every time I got onto Facebook the other day, I got a hint. I kept finding memes that said things about how victims of abuse need a voice when they can’t speak up, don’t be afraid to speak up against abuse, & other similar topics. I think it was 7 memes I found that spoke such messages to me. I realized what the purpose of all of this was. I need to be more outspoken against narcissistic abuse, & to help educate people about its devastating effects. People don’t know much, if anything, about such topics unless they have been a victim, & that needs to change. I realize that I alone can’t change the world, but hopefully I can make a difference. How I need to make a difference, I’m not entirely sure! So far, I think I need to focus on promoting & encouraging people to participate in The Butterfly Project with me, & share what I learn no only here in my blog, but also in my Facebook group & personal page. I’d like to ask for prayer on this topic from you, Dear Readers. I need to know what to do & how to do it. I also need wisdom & courage to do God’s will. While I feel peace about this, a part of me is also somewhat nervous. I feel that God will want me to make some of the posts on my personal Facebook page public, which is something I never do. This also allows people I’m not friends with to see those posts, which makes me uncomfortable. I don’t want strangers peek into my life. This also could include people my parents know who are on Facebook. While I know the things I write about regarding my parents are true & never said in a hateful way, they would be furious if they knew what I write about. I really don’t want to deal with that. This time, my publisher is offering 15% off all print books & free mail shipping until June 12. Simply use code COOKBOOK15 at checkout. My publisher is offering a sale on all print books: $5 off any $20 or more purchase. Simply use code NEWMOON at checkout. (code is case sensitive, so use all caps!) Sale ends June 5 at midnight. My publisher is having a sale again. 15% off all print books & free mail shipping through May 16, 2016. Use code MAYSHIP15 at checkout to take advantage of the sale. My publisher is having another sale! Use code APRSHIP20 at checkout to receive 20% all print books & free mail shipping until May 1. I vowed some time ago to keep my blog real, to be honest about my experiences, both the good & bad ones. My hope is that you can learn from my mistakes. Although I’ve read “Boundaries” several times, I never related to that quote so well as I have recently. It perfectly sums up how I’ve always felt. Interestingly, this quote came to my attention a couple of hours after receiving a message from one of my readers. When I saw I had a message, I cringed a bit. Not because the person was someone I didn’t like (she was lovely to talk with) or I didn’t want to help this person, but because I have gotten so tired lately of all things narcissism. I’ve also been more depressed than usual for about a month. Considering my feelings & then this quote, I immediately realized something about myself. I haven’t been practicing what I preach. I haven’t been taking frequent breaks. I slipped back into the old, dysfunctional habit of feeling as if I need to be there for anyone & everyone, at all times, always being the strong one & fixing everything. I really hate backsliding! It’s especially insulting since I was doing better in this area. God showed me a few months ago that when I got so sick in 2015 from carbon monoxide poisoning, one of the reasons was basically to force me to take better care of myself. Since getting sick, sometimes now my body &/or mind gets extremely tired & I have no choice but to rest, which has proven to be a good thing. At least until this past month, when I slid back into ignoring my physical & mental health, pushing myself past my limits. I decided the other day this has to stop. Right now, I have a sick kitty who needs my attention & I also need a break from all things narcissism. While I was recovering last year, I was able to write many blog posts. So many, I have them written 3 months in advance. Plus wordpress publishes them to Facebook, Google Plus, Linkedin, etc. automatically. I don’t write blog posts every other day, as it may look since that’s when they are published. Please keep that in mind if you try to contact me via this blog or my social network sites. If I don’t respond quickly, please forgive me, but I needed a break. Otherwise, I’ll respond quickly. Interestingly since I decided to take breaks, I already feel less pressure & depressed. Knowing I can take breaks as needed has taken a large weight off my shoulders! My reason for this post, Dear Reader, is two fold. For one thing, I want you to know what is happening, so if I don’t respond to you in a timely manner, you won’t feel that I don’t care. I truly do! I also care about myself, though, & know being “on call” is too much pressure for me to handle. For another thing, I want you to learn from my mistake. Never, ever forget that Narcissistic Personality Disorder & recovering from narcissistic abuse are extremely serious, complex & painful topics. Frequent breaks from thinking & talking about narcissism are absolutely vital to one’s mental & physical health! I think it is very normal to obsess at first. Once you have an answer to why someone treated you as they did, it’s only natural to want to know more about why they behaved that way. It also feels so good to learn that you aren’t the problem as you were told you were. Who wouldn’t want to understand why they were blamed for being abused?! And, since narcissism is so complex, it’s pretty much a bottomless pit of things you can learn about it. You should learn about narcissism. It will empower you to do so. That being said though, due to its complex nature & the pain of narcissistic abuse, you will need to take frequent breaks away from the topics. During those times, refuse to think about or discuss narcissism. Relax. Do things you enjoy. The balance will help you to stay strong & avoid depression. You’ll know when you need a break, too- your mood will sink & you’ll be thinking about narcissism constantly. Listen to these cues! I didn’t, & look what has happened to me. Please learn from my mistakes & don’t make the same ones I have! My publisher is having another sale. Been plenty of them lately! This sale is for 20% off of all print books until April 3, 2016. Use code SHOWER20 at checkout (all caps- codes are case sensitive). Save $5 on every $25 or more print book order from my publisher. Use code SAVE5 at checkout. Sale ends March 25. My Books Are On Sale- Today Only! My print book & sometimes ebook publisher is offering a really good sale but it’s today only. All print books are 25% off, ebooks 5% off! Use code AMAZING16 at checkout! Since I began writing about narcissism, surviving narcissistic abuse & the awful effects on its victims, some people have told me I need to focus on writing about lighter, more pleasant topics. It’s too negative. People need to think about positive things, not just the negative. I only write about what I do because I’m wallowing in the past. I need to forget it & move on. The truth is, I do agree with the fact that people need to focus on positive things, not just the negative. That is all I agree with in the above statements however. In all honesty, writing about narcissism isn’t easy. I’m often learning something new, & it can be depressing just how pervasive narcissism & narcissistic abuse are. I get tired of it all. It’s a very emotionally draining topic & can be triggering for my C-PTSD. I have to take time to deliberately refuse to focus on it to help me not to get mired down in the depressing negativity that is narcissism. That being said, I don’t plan to quit anytime soon. For one thing, I believe God wants me to write about this topic. He has given me the ability to write & also to understand quite a lot about narcissism. Not that I know everything on the topic of course- I don’t think anyone does- but I do know a lot. My personal experiences have taught me a great deal as well as things I have read. For another thing, when someone thanks me for teaching them something they’ve been searching for an answer for, it is incredibly rewarding. It’s also rewarding to let people know they aren’t alone. Since narcissistic abuse makes its victims feel so alone, learning they aren’t is a really big deal! There is nothing more rewarding than knowing you helped to improve someone’s life. That alone makes it all worth while! And, in all honesty, writing helps me as well. I’m finally validated! Seeing things in writing somehow helps me to realize that what happened to me was real, & it was terrible. It makes it more real than just remembering things, probably since I dissociated so much as a child. It also helps validate me when people believe me & offer support & understanding. That almost never happened until I started writing. So please forgive my selfish motive but I need this validation! If you are considering writing about your experiences with narcissistic abuse, just know it won’t be easy, but it will be worth it! Remember that if you opt to write about it, narcissism is a terribly negative topic. You will need to counter the negativity with positive. Indulge in things you enjoy often, such as a favorite hobby. Do nice things for yourself to reward yourself after writing. Even a short blog post like this one can be surprisingly draining sometimes- reward yourself for putting forth the effort. Make time where you flatly refuse to think about NPD or anything related to it. Deliberately focus on something else. Anything else. If you opt to write a blog, write posts in advance & schedule them to publish without your assistance. That way, if you feel inspired, you can write several posts at once, or if you feel uninspired, you can take a break. Your blog will post anyway. I have a lot of posts ready to go- over 3 months into the future. Don’t feel bad for taking frequent breaks. It’s good for your mental health! If you choose to write a book, be forewarned- that is much more challenging than writing in a blog. Blog posts are usually short which makes them easier to handle. Writing a full book, however is different. Chances are, you’ll go on a bender & end up writing a lot in one sitting, probably often, which will exhaust you. You may plan to write for only half an hour but end up spending your afternoon in front of the computer. Trust me on this one- been there, done that! Writing a book about narcissism, especially if it is about your personal experiences, is an emotional roller coaster. So if you are considering writing about narcissism, I strongly urge you to pray about it. Ask God if this is the route He wants you to take, how He wants you to write (blog, books, etc) & if it is, to enable you to do it. Ask for strength, courage & wisdom, because you will need all three & more. A few days ago, I finished a book for parents of children affected by narcissistic abuse. I believe it will help those of you in that painful position, including those of you co-parenting with a narcissist. The book is shorter than my other books, but please don’t be discouraged by its size. I would rather print a small book full of good information than a much larger one filled with fluff. And, I’m sure readers prefer that as well. Since I’ve learned so much about narcissistic abuse & started writing about it, I’ve had many people contact me looking for answers. Some I simply can’t help, because helping others is hard on me emotionally. It’s a tremendous responsibility helping people, & I take it very seriously. When people ask me for help, I try to offer it to the best of my ability. Even if I’m writing books or blog posts like this, I want to provide good, helpful, truthful information. As a result, people look to me as if I have all the answers sometimes. The fact is though, I don’t. I also make mistakes. Lots of them. And often. When I first started writing about narcissistic abuse, I was loathe to admit mistakes I’ve made. Frankly, it can be embarrassing sometimes. I’ve done some amazingly dumb things! As time has passed though, I realized that people have more respect for someone who is real, willing to admit their shortcomings & mistakes, than they do for someone who acts as though they never slip up. There are three preachers on TV that I absolutely love & have loved since I first became a Christian- Jesse Duplantis, TD Jakes & Joyce Meyer. Aside from the fact their preaching makes so much sense to me, they also admit their mistakes & shortcomings. They’re real! Listening to them or reading their books never makes me feel bad about where I am in life. Quite the opposite. They make me realize I’m OK while encouraging me to continue learning & growing. Another bonus to being open is you lose the shame over your flaws. Bringing them into the open loosens that shame much like sunlight destroys vampires in the old legends. Hiding them gives them power over you. Power to keep you feeling embarrassed & even ashamed of yourself. The reason I’m telling you this, Dear Reader, is to encourage you. No doubt that as you recover from narcissistic abuse you will begin to share some of your experiences. Maybe only with those very close to or maybe you will feel led to write about it like I have. In any case, I want to encourage you to be open about it. People will respect you for your transparency. So few people in the world are genuine these days, & the few that are, are greatly appreciated. And, if you end up in a position of helping others, they will be encouraged when they realize you, someone who is teaching them, have made mistakes & are able to learn from them. They also will feel comfortable enough to approach you. You may be the only person they tell about their painful experiences, & opening up can help them tremendously. It’s funny… sometimes your mistakes really can be a part of your ministry to others! Recently, I had an interesting dream. It showed me that I need to change direction slightly with my writing. I’ve been sensing I need to do this for a while, but I think now is the time to do it. While definitely narcissism & what I learn about it as I go will be a priority, I believe it’s time to include other, lighter topics as well. What those topics are, I’m not sure yet. God will lead me, as always. I’m open to suggestions though- you can comment on this post or email me at CynthiaBaileyRug@aol.com. I’ll pray about the suggestions I receive before writing about them, so your suggestion may appear a while in the future or may be tweaked a bit when I write about it. Please don’t take that personally- I lean on God a lot with what I write, much more than people. Anyway, I think this is a good idea to lighten up some. The simple fact is writing & focusing about narcissism so much can be pretty overwhelming for me, & I don’t need the C-PTSD triggered any more than it already is. I think reading about it can have the same overwhelming effect on many people. Learning about narcissism & the damage it causes is essential to your healing from narcissistic abuse, of course. It helps you to heal & gives you the answers you’ve been wanting. However, it is also an extremely negative topic & can take a toll on your emotions. Physically it can drain you, too. I find it’s best to have balance- times where you learn about narcissism & related topics, time where you focus on your healing, but also times where you refuse to think about such things, instead focusing your energies into more positive, lighter endeavors. Not doing so, but instead focusing constantly on it brings you down badly. I’ve noticed it on various Facebook pages or groups for adult daughters of narcissistic mothers. So many people obsess, & you can tell just by how they write that they aren’t happy. They spend all their time thinking about the horrors they have been through or abusive people- how could they be happy?? Instead of doing that, I would like to encourage you today to take breaks. You’ll know when you need one- you’ll begin to feel your emotions starting to sink. You’ll catch yourself thinking of your own awful experiences or you’ll be angry at your narcissistic mother often. You’ll think mostly about narcissism. These are signs it’s time to take a break. Take an afternoon or even a few days where you deliberately refuse to focus on anything related to NPD. Indulge in your favorite hobbies, read a new book, hang out with close friends.. do things that you enjoy & make you feel good. Then, you can get back to a more balanced approach. You’ll feel much better about it after your break. I finished my latest book, “Life After Narcissistic Abuse: There Is Healing and Hope”!!! YAY ME!! This book is all about describing the variety of symptoms survivors of narcissistic abuse experience, & offering some suggestions on how to cope with & heal from them. I have learned a lot in the last couple of years about this topic, especially in the last few months, & put it all in this book. God has showed me so much, & I’m praying what I have learned will help others as well. I’ve asked God to guide my writing. I ask God to show me what to write about (admittedly, probably not as often as I should..) which is where my blog & book subject matters come from. I’m going to be praying more about this topic though & would appreciate your prayers as well. I’m sure this urge to cover other topics isn’t only me- it’s God guiding me, probably preparing me for something else that is on its way. I’ve started a little.. I’ve decided once my current book on recovering from narcissistic abuse is done, my next book project will be finishing the fiction book I started a few years ago. That book is maybe one third done..it’s time to finish it. Maybe I could write some about natural/herbal things. I know many people associate such things with casting spells & such, but I don’t. I believe God created herbs & plants with the properties they have for a reason & for our use. Why shouldn’t we benefit from them? I love herbal remedies & beauty recipes. I’d love to share what I know as well as learn from others. I just wanted to take a moment today to talk to all of you who read my blog, & to extend a very warm welcome all of my new followers! I can’t thank you enough for following my blog- it is very humbling & flattering when people read what I write. I never take anyone for granted, & truly appreciate every one of you who follow my writing. Even more humbling & flattering are all of the wonderful comments I’ve received lately about how my work is helping people from old & new fans. Thank you so much everyone!! Is Discussing Narcissistic Abuse Too “Negative”? I’ll admit, the main topic of my writing, narcissism & narcissistic abuse, aren’t exactly positive, happy topics! I’ll also admit that sometimes, it gets to me, writing about such dark things. That being said, I will continue to write about what I write about for several reasons. Also, writing about what I learn helps me to make sense of the things I have gone through, as well as to help others to do the same. So many who have suffered with narcissistic abuse are struggling to make sense of it all. I can help a little by sharing my experiences as well as what I have learned. Writing about things also helps to loosen the hold the abuse has on me. By being open about things, I am losing the shame I once felt for being abused, & am able to see more & more how none of it was my fault. This not only helps me, but enables me to get the message to other victims that being abused is NOT their fault. It also helps to make my pain count for something. Knowing I am able to help other people means my pain was not in vain. Something good has come from something horrible! Also, by being open about the taboo topic of narcissistic parents, it helps to raise awareness of this insidious, evil form of abuse. It makes it safe for victims to talk about it with other victims instead of quietly suffering alone. So many are afraid to talk about what their mother did to them, because so many people put mothers on a pedestal. People make victims feel guilty for being abused, as if it was their fault! They can’t seem to grasp that a mother would abuse her child. Certainly the child must be exaggerating. Of course the mother made mistakes- no one is perfect- & the child should forgive the mother. And, let’s not forget “honor thy mother” seems to mean “allow thy mother to abuse you” to many people. Because of people like this, as well as the ignorance surrounding Narcissistic Personality Disorder, there needs to be more awareness of this horrible phenomenon. Don’t let anyone quiet you for talking about your experiences with your narcissistic mother, father, sibling, grandparent, friend, spouse or co-worker. You aren’t being negative by discussing your experiences. And, chances are, by discussing them, you are not only helping yourself to process your horrendous experiences, you are also helping to enlighten others who need to hear your story! So be open- talk about it! Dear Readers, I just wanted to let you know that although I’ve been trying to post daily, I’m going to have to reduce posting to every other day, at least for now. I’ve realized posting daily is too stressful for me. The last six months or so of my life have been over the top chaotic, & even though things are calming down, I’m still feeling super anxious. Naturally that anxiety makes the C-PTSD flare up. (Yay me.. not.) So, I need to start practicing what I preach & taking better care of my mental health. One way to do that is to reduce stress so unfortunately that means reducing blog posts a bit. I’m sorry about this, & hope it isn’t permanent. I also appreciate your understanding. Also, if you wish to meet others who have survived narcissistic parents, you can go to my private forum at: http://cynthiasforum.boards.net/ or you can join my closed facebook group at: https://www.facebook.com/groups/FansOfCynthiaBaileyRug/ Both have privacy settings in place, so what you stay remains within the confines of the forum or group, & only other members can see your comments. I was talking with my husband the other night about my work. I mentioned how other teachings on narcissism I read sometimes just don’t sit well with me even if I normally agree 100% with the author’s thoughts, & how I do my best to be sure what I say can be backed up in the Bible. One thing came to mind during this conversation that has been in the back of my mind for years now,since before I started writing, in fact.. I was watching Joyce Meyer preaching on TV one day. She said she’d been asking God for more & more people to reach & to be able to help. In response to her prayer, God told her that as many people as she can help, she can also hurt, so be careful. i thought this is incredibly wise! So many people find someone whose teachings or preaching they like. They relate to much of what that person has to say, & they almost blindly follow anything that person says. This is NOT wise to do, however! Just because you identify with this person’s preaching or teaching, doesn’t mean this person is always right! All human beings make a mistake sometimes! I do my level best in my blog, on my website, in my books & anything I write to make sure what I say can be verified by the Bible. Yet, even so, I’m human. I’m sure I’ve made mistakes sometimes & will continue to make mistakes. I just try my best to keep those mistakes to a minimum. I have been blessed with some wonderful, caring, intelligent, empathetic fans who have sent me wonderful messages of support & thanking me for all I write. It’s amazing! I love those messages. But, I also want you to be sure that if you follow my writing, don’t do so blindly! If something doesn’t sound right to you, look it up. Pray about it. Like I said, I do my best not to make mistakes, but sometimes I just might make them anyway! & if you find something I’ve written is wrong, feel free to let me know your thoughts. I am very aware of what Joyce Meyer has said, that as many people as I can help, I can also hurt, & hurting people is the absolute last thing I want to do. This has been a somewhat sad day for me. I shut down my facebook page. Kept my personal one, but shut down my writing one. Due to someone harassing me for just over a year now & using that page to contact me, I felt it was best to shut it down. This has made me a bit sad. But, in a way, I’m thinking this may be a good thing in a way. I have a group on facebook where my fans & I can interact. We talk about all kinds of topics including animals, abuse & related issues, Christianity & naturally narcissism, & share some laughs. It’s a nice little place, so if you’re on facebook, I’d love it if you’d come check it out. If you aren’t on facebook or don’t care to join groups, then please check out my forum. It’s very quiet as it is just starting, but I hope it will pick up the pace quickly. Both the group & forum are going to be very safe places. I will police them to be sure troublemakers are removed as soon as they join. Both also offer some privacy- on facebook, the group is closed, which means although others can see you’re in the group, no one but members can see what you post. And, the forum? Only other members can see your posts. I strongly suggest creating a false name as your user name so others who do read your posts won’t know it is you posting if you want annonymity. Here is the facebook group link. Today I got a couple more emails from people looking for advice. I just can’t counsel people- I’m not qualified. Plus, mentally, I get drained & sometimes I get physically sick from talking with people about their problems. It isn’t that I don’t care, it is that I just can’t. Now anyone can access my forum, & hopefully find the answers they’re seeking. As far as privacy goes, I made the forum so anyone who wants to read it needs to register. I still want to suggest using fake names though, just in case you are concerned with anyone you know realizing you’re posting in this forum. Since I just started it about 10 minutes ago, it’s quiet, but feel free to come on by & introduce yourself! I look forward to seeing you there! My New Book Is Almost Ready For Publishing! My current book, “It’s All About ME! 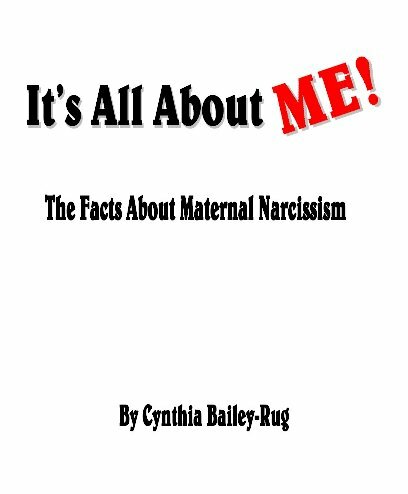 The Facts About Maternal Narcissism” is almost ready for publishing in print & ebook forms! I am hopeful to have this done in the very near future. I’d like to say within a few days, but since I never know how I’m going to feel (thank you, C-PTSD), I’ll say within a couple of weeks instead just to be safe. I will post when it is published, & share links of where the books can be purchased. Thank you everyone for your support & encouragement while writing this difficult book! I read a wonderful article on writing this morning. It consists of advice from the Master of Horror himself, Stephen King!! Whether you like his writing or not, if you wish to be an author of any genre, I strongly advise reading this article. The advice just makes sense! These tips are from his book, “On Writing- A Memoir Of The Craft,” which I also highly recommend. I love that book-it’s written very to the point, & it’s easy to understand, too. It’s also entertaining to read- it feels as if Mr. King is talking to you over a cup of coffee- & is chock full of wonderful advice. My current book about maternal narcissism is getting very close to completion. I hope you readers won’t be disappointed. It’s a bit shorter than I’d anticipated, but I believe it is full of tons of good information for daughters and sons of a narcissistic mother. I also believe the information is good for adult children of a narcissistic father as well. Progress On My Newest Book! With some very valuable input from the hubby, I created the cover for my new book. I’m not entirely sure this is going to be the title, but probably about 85% sure of it. (I’m toying with changing it from “The Facts About Maternal Narcissism” to “Parental Narcissism. Not sure though!) The wording will be the only thing that changes if I decide to change the title. I like the simplicity yet boldness of the cover. Now that the cover is complete, I’ll be getting back to work on completing the book! It’s getting close! 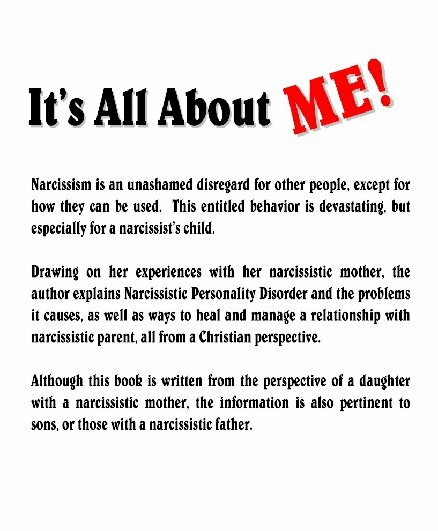 I am making progress on my new book about narcissistic mothers. As of today, it’s at 38,500 words (needs to be 40-60,000). Gettin’ there! And thank God for that, because this is one very hard book to write! I’m very surprised at just how challenging it is. After writing my autobiography, “Emerging From The Chrysalis,” I was sure everything else I’d ever write would be a walk in the park. Seeing the traumatic events of my life written out in black & white was very hard for me, yet validating at the same time. This book is not the same..not even close! Devoting an entire book to the topic of maternal narcissism has been a daunting task. I know a lot on the topic, but I was unsure if I had enough to fill up a whole book. I have asked God to help me out- make sure I leave nothing out of this book, & please teach me what I didn’t know that He wanted to be included. He has answered those prayers. I have been learning a lot! Things to include about the book as well as things in my personal life that I never thought of as abusive before. Wow. I never thought of this as abusive behavior! My ex-husband’s mother used to do this to me during the brief time we lived with his parents. I never understood why I had to work so much for her. I was responsible for all housework, balancing her checkbook, & maintaining paperwork & records for my ex’s father’s trucking business. Other miscellaneous tasks were assigned to me as well. There were three other adults in the house- why was so much on me? I now wonder if was because my ex was very much into isolating me, & if she was “helping” him by keeping me so busy. They were a very dysfunctional family, so that is a distinct possibility. Also the only answer I can come up with at the moment. Thinking back, she also didn’t like me spending time with friends or having them over to our house. Another isolating behavior. Whatever the reasoning behind this behavior, this new realization hurts. I loved his mother a great deal- she & I were good friends, & often had a lot of fun together, in spite of the frequent problems in our relationship during the time of living together. Something else to process. Yay for me.. not. Sometimes it seems like healing is the most frustrating, never-ending thing in the world, & sometimes I get so tired of new revelations that show me just how abused I have been in my life. Honestly, it gets depressing! I don’t like feeling sorry for myself, but it is hard to avoid 100% of the time. I know it can be healthy to indulge in a bit of self-pity sometimes, but even so, it doesn’t feel nice. Learning these things also makes me wonder what is it about me that makes people think it’s ok to abuse me?! Do I behave in a certain way that says “Go ahead- hurt me. Treat me like dirt. It’s fine!” UGH! In spite of my lousy mood, though, I’m still glad that God is helping me to heal, learn & grow. Yes, it hurts. Yes, it can be frustrating. However, it also is helping me understand behaviors & people a lot better. It’s answering some questions, like why do I get angry or hurt when people behave a certain way. Like with my ex- mother in-law. Her list of “duties” for me to do every day used to really make me angry at the unfairness of the amount of duties I had to contend with compared to everyone else in the house. But, I never knew why until today. Now, I understand, & feel validated. Angry, but validated, & at least the anger won’t last long- I am usually pretty quick to forgive. This really lousy mood is telling me that it’s time to relax. Maybe stop working on the book for a little while, too. Relax, turn on some good music or watch a good movie or tv show, do some nurturing behavior that makes me feel good like crafting or snuggling the furkids. & no cooking- hubby is either taking me out tonight or we will have something delivered.